Hi Ashton! Firstly, tell us a bit about yourself. My name is Ashton Smith. It feels so weird to say ‘Smith’ – was Long but I recently got married to a truly selfless, talented, genuine and beautiful blue-eyed man. A few of my favorite things (more like obsessions) include pottery, succulents and coffee. I’m an east coast girl, born and raised here in North Carolina. I absolutely adore this area because we get to experience every weather extreme, and we are only a 3-4 hour drive from both the beach and mountains. It’s perfect! (Although, I will always be a mountain girl at heart). This season of life has been absolute craziness. Planning a wedding, finding a house, finding things to put in that house, setting budgets, dealing with different family dynamics, building a business and trying to stay sane has been quite the journey. One thing I’ve been learning during this hectic time is to find beauty in the chaos. I’m choosing to acknowledge the beauty amongst the mess because there truly is beauty in all of it! Absolutely love and resonate with all that you’re doing with The Authentic Woman. Why did you start it? Was there a lightbulb moment or experience that inspired its vision? The Authentic Woman originally started out as my own personal blog called Altogether Beautiful. I’ve always loved writing and photography so a blog seemed to make sense. In May of 2017, I launched Altogether Beautiful as a lifestyle blog where I discussed everything from self-discovery, self-love and personal growth. The things I loved discussing most were empowering women to discover their purpose, embrace their authentic identity, and be a catalyst for positive change in the world. I quickly realized that my ultimate vision was very action-based. Meaning, I wanted to create impact on society, culture, and ultimately, the world. With that being said, I also realized that I needed so much more than my own voice to create the kind of impact I was seeking. My ultimate desire was to create a platform where women felt a sense of belonging, power and beauty. I wanted to create a community where women felt empowered to realize their value so that they too could change the world. So, around August of 2017, we began to re-brand the website and design our first Volume: Beauty Unleashed. This volume released in December of 2017, and on 8 March, 2018 we released our Volume II: Bravery Rising**. It was quite the whirlwind, but without Altogether Beautiful, The Authentic Woman wouldn’t exist. The Authentic Woman is something to embody. How do you personally know when you’re living authentically? To live authentically is to bravely embrace the real you. Living authentically is a life-long journey. It is also a life-long choice. We have to choose the path towards authenticity – we have to choose to boldly embrace our identity, our body, our purpose and our story. It’s definitely a lot easier said than done. 1. Is comparison evident in your life right now? 2. Are other people around you living more authentically as a result of you doing the same? Comparison is the quickest way to veer off the path to authenticity. When we’re so busy looking at other people and aspiring to be them, we lose sight of who we really are. In addition, I think the biggest way to see if you’re living authentically is by observing the people around you. Are they living an authentic life? 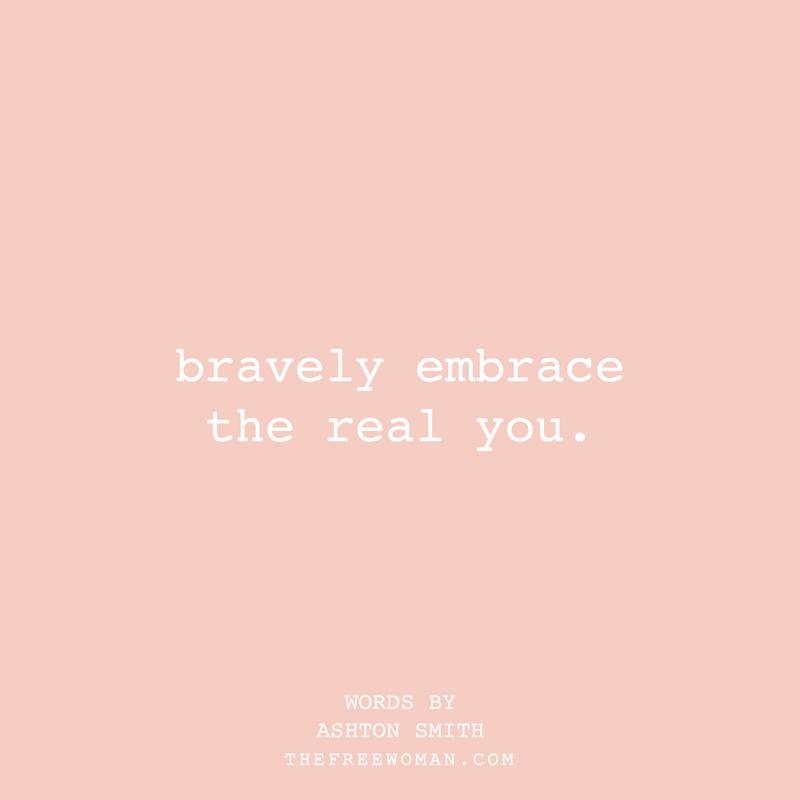 Are they bravely embracing their story? Are they sharing their truth with the world? When we live in our most authentic form, it naturally inspires others to do the same. When we live in our most authentic form, it naturally inspires others to do the same. What values do you live by and why? Authenticity is kind of my motto, and there’s a reason for my obsession with this value. When we are living in our most authentic form, we are living our most full, brave, free, happy and purposeful life. When we step into who we really are, we tap into our natural strengths, talents and abilities. And by tapping into those, we can better serve the people around us and ultimately positively impact the world. It’s this beautiful cycle that reaps such great reward. (I could talk about it for days, which I guess is why I created a book about it). Haha! Life isn’t sketched out on paper before us and planned strategically. No, life throws curveballs at us every day. It’s chaotic, messy and sometimes painful. I think one of the biggest ways we can live our fullest and happiest life is by choosing to be thankful. We get to look at the mess and beauty before our eyes and choose what we fixate on, and that choice is such a powerful one. A thankful heart is a healthy, happy and whole heart with the ability to extend love, kindness and hope to those around it. One of my biggest passions is serving the ones before me. Whether it’s 1 or 1,000 every human life is valuable. I choose to serve people by empowering them, speaking truth and revealing my authentic story. The world is waiting for an experience with someone who is REAL. People are waiting for someone to answer their questions and reveal the truth. When we can figure out how we can best serve those around us, I think we have accessed another beautiful layer to this life. You’re passionate about body confidence and open in sharing your body journey. What is something you know now that you would tell your 16 year old self? 1. Beauty isn’t defined by tall, skinny, tan, “perfect” women. Beauty is the essence of a human life. 2. Always, always, always choose health over perfection. 3. The number on the scale means absolutely NOTHING. My relationship with my body is a fundamental piece to the puzzle of The Authentic Woman. It was my passion, concern and even anger towards this topic that fuelled the fire in me to create this platform. 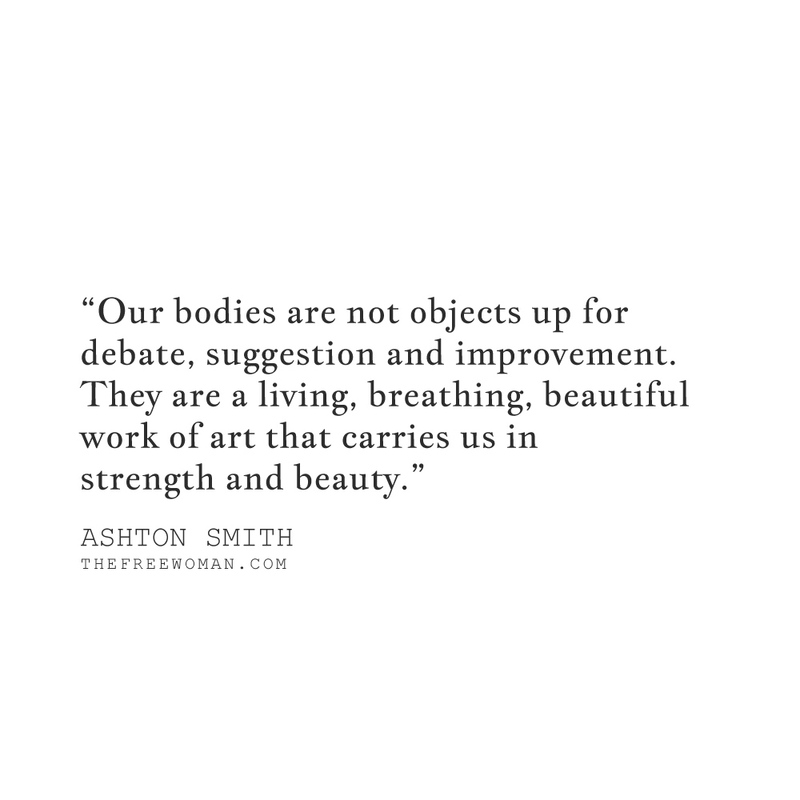 Our bodies are not objects up for debate, suggestion and improvement. They are a living, breathing, beautiful work of art that carries us in strength and beauty… and the world needs to represent this fact a LOT better than they do now. One way that I am working towards creating a new, fuller, and more accurate standard of beauty in the world is by non-retouched photography. None of the women in The Authentic Woman Series have been altered in any way. Everyone encounters ‘bad days’ when they simply don’t feel comfortable in or love their body. How do you navigate those days? Are there any particular truths you remind yourself of or self-care routines you put in place to stay kind to yourself? Everyone has bad days, and I’d be lying if I told you that I feel confident in my body every single day. Some days I’m bloated, my skin is breaking out and my jeans are a little tighter than usual. I think one thing to remember is that this is okay. Not only is it okay, but it is perfectly normal. You are not alone in your insecurity. Lately, I’ve been enjoying following social media accounts (particularly on Instagram) where women share very openly about the fluctuations with their body. I’ve also been very intentional about viewing a well-rounded representation of women online. Meaning, I follow accounts with larger, medium and smaller women in order to train my mind to realize that beauty doesn’t come in one size. Lastly, listen to your body. If you’re bloated and craving chocolate, eat the dang chocolate. Don’t set such strict and unrealistic goals for yourself (in your diet and in the gym) because it will leave you entirely unhappy. Find balance and listen to your body when it needs something. Oh wow. There are TONS of women that I look up to. Here’s a few that have been inspiring me lately: Jenna Kutcher, Rini Frey and Dani Nagel. All of these women have one thing in common: they are unashamedly, bravely and passionately themselves. Jenna and Rini talk so much about body positivity, and they portray a true, authentic and real standard of beauty to the world (the ups, downs and everything in-between). Dani is a freaking boss-babe that is bravely and boldly herself in her design process and business strategies. The biggest quality that inspires me in others is when they are boldly themselves. Because there is SO MUCH power in that! To me, being a free woman means living in your most authentic, honest and real form. I feel like we are the most free when we are confidently and securely living as our truest self. If you were sitting down having coffee with a feminine heart, what gem of wisdom would you share with her? Who you are is always and forever enough. The beautiful, complex and messy parts of yourself contribute to your beauty – nothing could ever take away from it. Your worth is proven evident by the breath in your lungs and the beating heart in your chest. Your worth has been inherently yours since the first breath you ever breathed, and it can never be taken away. GO-TO CAFE ORDER | A hot vanilla latte with almond milk (Girl, I’m gonna own my basic, white-girl drink order). 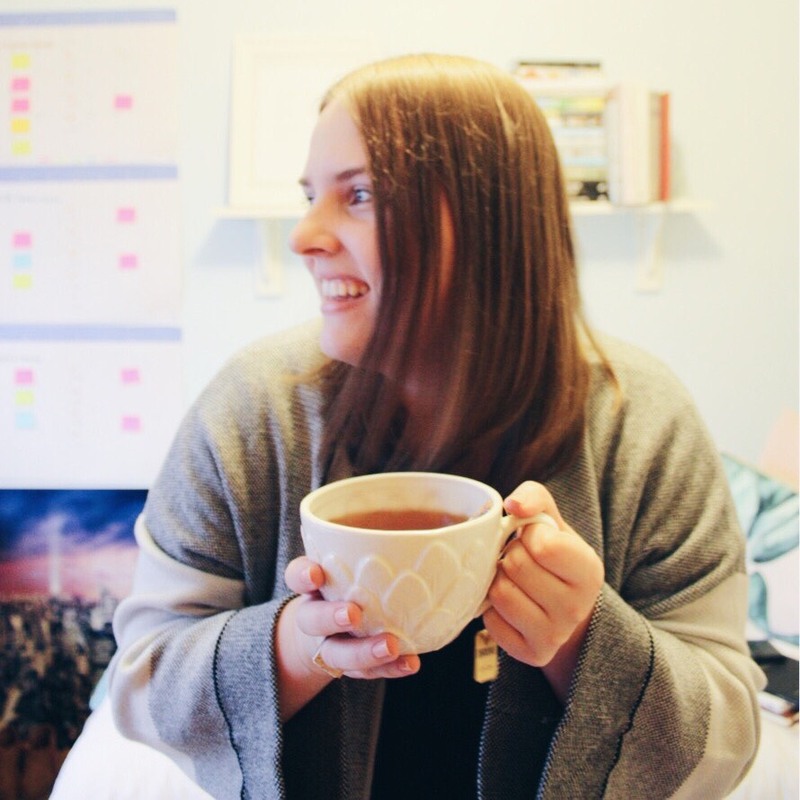 WHAT YOU LOVE ABOUT YOURSELF | I love that I’m a good listener with a genuine heart. (And I actually really love my hair – *insert monkey covering his face emoji). 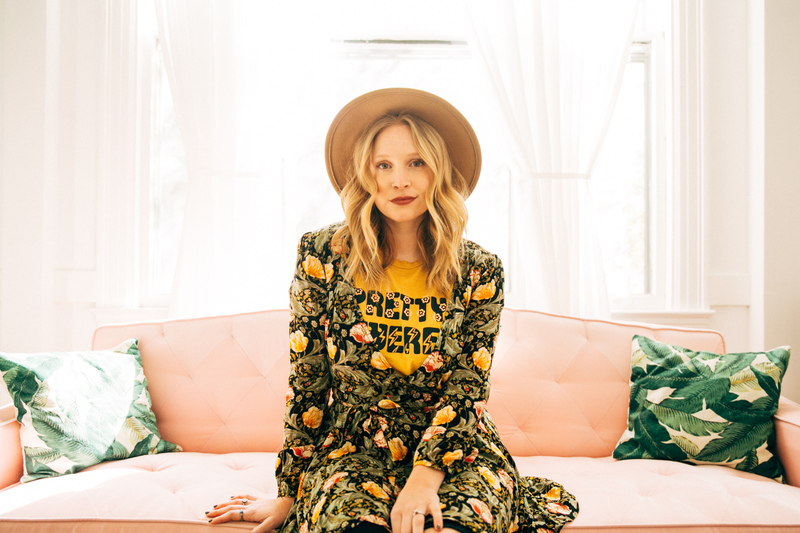 Ashton is the founder of The Authentic Woman, a platform that empowers women to live authentically as themselves. She firmly believes that women have the power to shift culture, eradicate unjust standards and ultimately change the world. When she’s not working with her soon to be husband, she is most likely sipping on a cup of local coffee, swooning over pottery or adding to her succulent collection. ** Editor’s note: I had the pleasure of contributing to Volume II: Bravery Rising of The Authentic Woman Series. Use the code FREE20 at checkout to receive 20% off your order!